My Song File now has piano recordings* for all songs on the site! Quality piano melody is now only a click away for all 910 songs and will be included with all new songs. It's like having a pocket piano wherever you go! Piano melody is available for all songs for free and doesn't require a login. Even if you have a beautiful singing voice and perfect pitch, or have a piano in your classroom (and the skills to play it), piano melody recordings can still be very useful. 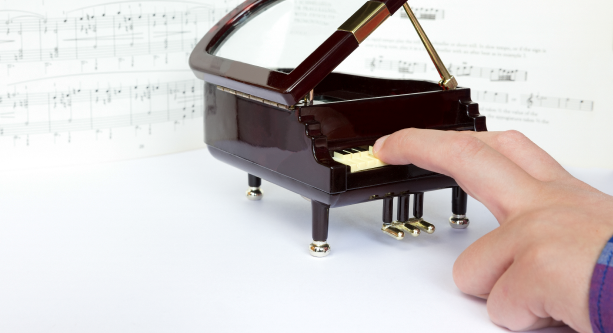 Read on for 7 ways piano recordings will make your life easier! Some lesson preparation tasks, like selecting new songs from an unfamiliar collection, are easier if a recording is available. For example, choosing songs for a multicultural theme, like the Lotus Flower Song (free sheet music for a limited time). Classroom music teaching is demanding on the voice so it's important to rest strategically. As the children learn the song, the melody can guide them more and more while you use your voice less and less. This is handy in songs like Danny Boy which has a wide melodic range (free sheet music for a limited time). Play a melody, like Hush-a-bye (free sheet music for a limited time) on a loop while students compose or practice parts or ostinato. Start with untuned percussion for young students, tuned percussion like xylophone (or other instruments like recorder) for more capable students. Classroom music teachers are amazing but can't do everything, like sing multiple parts in a canon. Think of piano recordings as a faithful side-kick. Guide part of the class with the recording for Banuwa (free sheet music for a limited time) while you guide another part of the class in canon. Sick days are inevitable, but you can still make every school day count. Use piano recordings to secure your students in intonation and tempo while they practice known pieces with a supply teacher. This works very well in Keep Your Lamps Trimmed and Burning as it has some tricky rhythms. You might also like to show your students the score (free for a limited time) so they can see how the ties work. Playing a recording allows you to move around the classroom and listen to your students. Ask them to sing the lyrics of Autumn Leaves (free sheet music for a limited time) along with the piano while you listen for intonation, expression and balance (i.e. how well your students listen to each other). A lovely Japanese Folk Song written in re pentatonic scale. A beautiful Irish folk song. A beautiful lullaby in natural minor. A beautiful 4 part canon from Liberia. A beautiful African American Spiritual in minor tonality. A lovely 2 part canon that can be used to teach the Major scale! A beautiful Canadian folk song in la pentatonic scale.